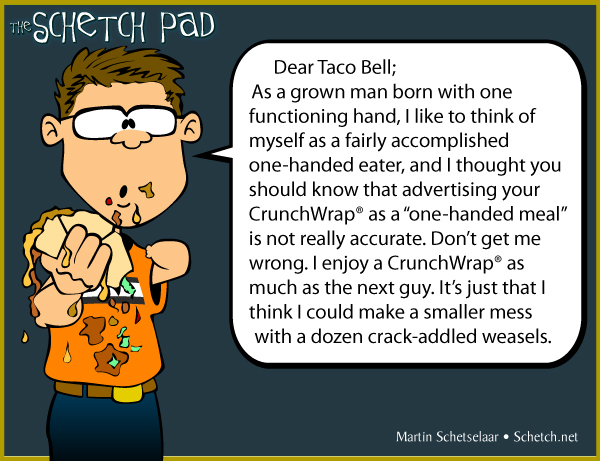 As a grown man born with one functioning hand, I like to think of myself as a fairly accomplished one-handed eater, and I thought you should know that advertising your CrunchWrap® as a “one-handed meal” is not really accurate. Don’t get me wrong. I enjoy a CrunchWrap® as much as the next guy. It’s just that I think I could make a smaller mess with a dozen crack-addled weasels. I guess it takes at least two hands to unwrap. The ads seem to be saying, “You can eat this with one hand while you do other stuff with the rest of your faculties.” I find I have to pay attention to the food to keep it from going everywhere (which does not combine well with driving…).